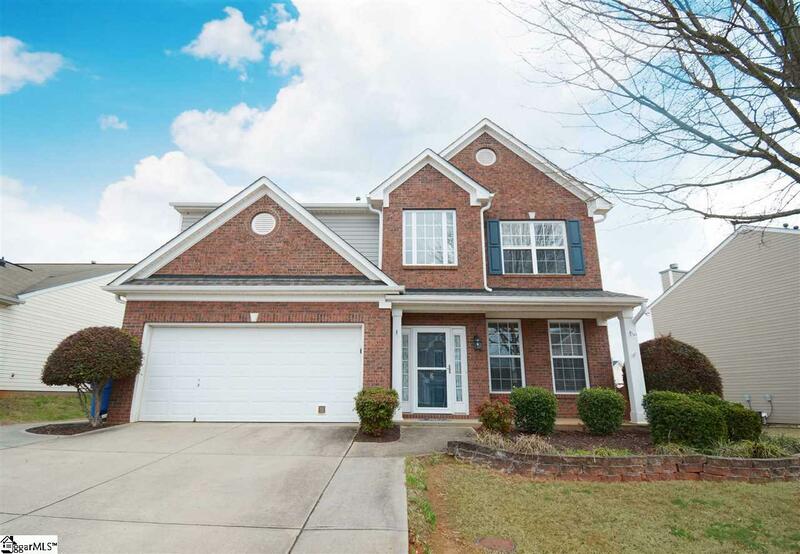 Located in Greenville towards Mauldin, this beautiful home is in a highly sought after neighborhood! This home features a beautiful exterior, including a front porch where you can relax on a cool day! The backyard is fully fenced for privacy, and so your kids or pets can run around safely. The patio is the perfect size to host a barbecue, and hang out with friends and family! The interior of the home features neutral paint colors and beautiful flooring. A two story foyer greets you as you enter the home, and the hardwoods begin here and go throughout the house. The dining room features large windows, beautiful wall panels with crown molding, and a raised ceiling. Dinner parties will be taken up to a whole new level in this home! This beautiful remodeled kitchen features lots of counter space and cabinets, and partially overlooks the living room. There is also a breakfast room area just off of the kitchen, for when you have smaller meals. The living room features a gas log fireplace, and is a great open area. An office or study room is also located downstairs, perfect for your home business! A half bathroom is also conveniently located downstairs. Upstairs, you will find all four bedrooms. The master suite features french doors, a walk in closet, and a bathroom with a garden tub and separate shower! The other three bedrooms all have access to another full bathroom, and are definitely large enough for your family or visiting guests! You could even choose to turn one or two into a playroom or exercise space. This gorgeous home is in an amazing location, and it&apos;s a dream home for sure! Come see why it should be yours today!! New Roof 2018 Remodeled Kitchen 2018 Remodeled Half Bath 2018 New A/C unit 2016 Great family home in the Summerfield neighborhood. Perks of the neighborhood: Monthly events, basketball court, playground and a pool.